Plot Summary: Seigaku and a familiar selection of Japan's other top junior tennis teams gather in Wimbledon, London, for a tennis tournament. 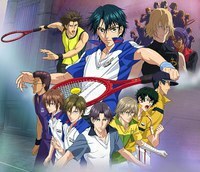 During tennis practice, the Japanese players are suddenly attacked by a violent "street tennis" group that calls themselves "Clack". An encounter with a former Clack member named Siu leads Ryoma and his friends into a battle with Clack to confront its leader, Keith, and discover his reasons for having such a violent approach to tennis. Part Cooperation: Trans Arts Co.